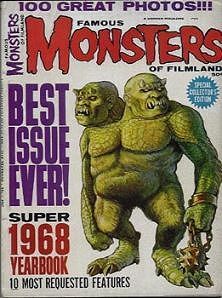 Near-mint copy of the Famous Monsters 1968 Yearbook with many articles and photos from past issues. Cover has some minor newsprint soiling (from being in contact with other magazines, no doubt), but is otherwise near-mint. This copy features the ten most requested articles from past issues, meaning that these have been reprinted before in other Yearbooks and issues. Website design and hosting by Sohodojo Business Services. Item 163 of 466 items displayed in viewer. 0 items in cart.